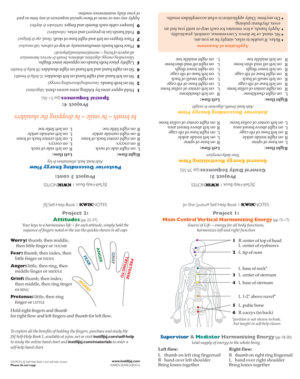 This chart is a handy mini-reference book for the Jin Shin Jyutsu beginner. Mary Burmeister’s Jin Shin Jyutsu Self-Help Book 1 is the best introduction to the art of Jin Shin Jyutsu (visit jsjinc.net to purchase). When first learning JSJ, we are invited to be the testimony, to experience the benefits of JSJ for ourselves. The greatest benefits come from daily practice and the KwikNotes mini-book makes it easy to practice. It puts all the flows presented in Self-Help Book 1 on one page, which is then folded down to a size handy enough to carry in your pocket, keep on your bed-side table or tuck under a magnet on the fridge. Once you have printed the page (be sure it is set to print at 100%), fold the page into quarters with the Main Central Vertical Harmonizing Energy flow on the front. Tip: to get a nice, crisp fold, after folding the page horizontally with your hands, go over the fold with the back of a spoon, applying light pressure as you go. Do this again for the second vertical fold. Self-Help Book 1 KwikNotes © copyright 2016, Karen Searls. All rights reserved. The Self-Help Book 1 KwikNotes is for your personal use and does not come with distribution rights. No part of this chart may be reproduced, stored in a retrievable system, or transmitted in any form or by any means – electronically, mechanical, photocopying, recording, or otherwise – without written permission of the copyright holder.